Using Bluetooth wireless technology the Apple Wireless Keyboard provides a reliable, secure connection to your Mac with no cable clutter. The full-size, yet compact wireless keyboard takes up very little space on the desktop and easily fits on a user's lap. Important: Requires a Bluetooth enabled Macintosh (either built-in or using the qualified D-Link DBT-120 USB Bluetooth Adapter (Hardware version B2 or later. Older D-Link DWB-120M adapters are not supported). Mac OS X, v10.2.6 or higher required. 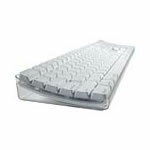 This used Apple Wireless Bluetooth keyboard is in good condition and ready to ship out.